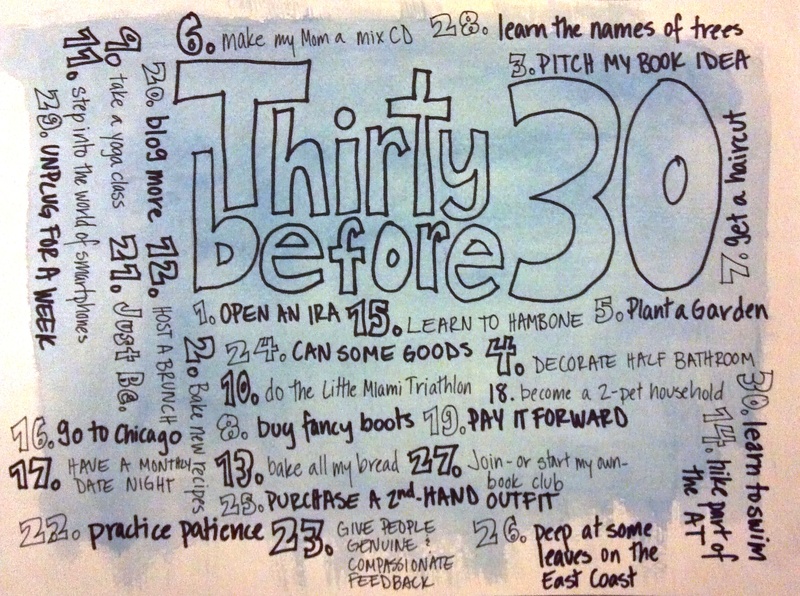 Alright, folks, here it is, my Thirty Before 30 list! Let’s just jump right in, shall we? 1. Open an IRA: This is a biggy. Don’t you think 30 is a good age to not be 100% reliant on an employer for all of your retirement savings? 2. Bake new recipes: Honestly, I get into baking ruts. At this point in my life, I probably have my go-to Chocolate Chip Cookie recipe memorized. 3. Pitch my book idea: I’ve had this idea for awhile and I’ve started writing a sample “chapter” and drafting a pitch letter. Wish me luck! 4. Decorate the half bathroom: Decorating is really, really hard for me. But, I have a vision for this bathroom and I want to make it come to fruition! 5. Plant a garden: Let me tell you, even if I wasn’t turning 30 years old, I’d be doing this. I’ve even ordered this book to help me get started. 7. Get a haircut: When I moved to Cincinnati, I was under “Operation Luscious Locks”–my plan to grow out my bob and have, well, luscious locks. Now, I’m ready to be liberated from my mane! 8. Buy fancy boots: Because, I don’t have a pair, want some and need to overcome my “big calf” issues. 9. Take a yoga class: For the past year I’ve been “doing yoga” based on a book. I’m not fond of gym class, but I’d like to give a yoga class a try. 10. Do the Little Miami Triathlon: Someone is going to have to do this with me. Trust me, it’ll be fun. 11. Step into the world of smartphones: I just think having a really good camera attached to a phone would result in me taking more pictures/capturing more blog fodder. 12. Host a brunch: Easter? Maybe New Year’s Day? I’ll serve quiche! 13. Bake all of my bread: I’ve already started doing this since I got a bread machine for Christmas. I’m tired of crappy loaves of store-bought bread full of who-knows-what. 14. Hike Part of the Appalachian Trail: I’ve finally decided I never want to the the whole thing in one shot. Have you read A Walk In the Woods? 15. Learn to hambone: This just may be the most difficult thing I attempt. 16. Go to Chicago: It’s like the “big city destination” for Cincinnatians and I’ve never been there. 17. Have a monthly date night: Enough said. 18. Become a 2-pet household: Either let my husband convince me to adopt a greyhound or convince my husband to adopt a second cat. Or, get a chicken. 19. Pay it forward: After a rough 2011, I was impressed and humbled by all of the people who supported me and cheered me on. I’d like to pay it forward…I just haven’t figured out how yet. 20. Blog more: Ta-da! This list should help. 21. Just be: I always feel the pressure to always be creating–doing something productive. This one will allow me to enjoy little things, like summer dinners on the screened-in back porch. Ah! Is it spring yet? 22. Practice patience: The Universe can’t always schedule it’s day around mine, so I want to be a little more patient when I have a conflicting plan. 23. Give people genuine and compassionate feedback: Basically, “being nice” sometimes results in “not telling someone how they’re making your life extremely difficult.” This applies more to a workplace atmosphere. I want genuine and compassionate feedback, so why not dole it out myself? 24. Can some goods: This goes along with the gardening. I want to can some jams, jellies, salsa, anything! 25. Purchase a secondhand outfit: I’m pretty good at donating clothes I don’t wear or need anymore, but I want to buy at least one secondhand outfit so I can close the loop. I will say that I’m excluding underwear from this. As always, I’m inspired by Patagonia. 26. Peep at some leaves on the East Coast: For awhile now I’ve wanted to drive up the East Coast. I’ve never been up there and it’s about time I do some exploring. Plus, the chance of seeing L.L. Bean‘s giant boot is pretty enticing. 27. Join–or start my own–book club: I don’t know why. Maybe because I want someone to tell me what book to read next or maybe some suggestions. We’ll see. 28. Learn the names of trees: Age has nothing to do with it. I want to learn more about nature. 29. Unplug for a week: I do enjoy checking Facebook and my email. But, I’ve heard some good things about unplugging for a spell and want to give it a try. 30. Learn to swim: I’m actually just fine in water if I have a life jacket on, but I want to take it to the next level. At one point in high school, I was able to swim on my back sans a flotation device. Let’s see if I can do it again! Now, I’m a realist. I know I won’t be able to accomplish 100% of the items on this list, but there’s something to be said for trying. And, if I don’t get them all done at least I’ll have things to do before I turn 31. Stay tuned for updates!